This handbook provides information about the threat posed by earthquakes in the San Francisco Bay region and explains how you can prepare for, survive, and recover from these inevitable events. If you live or work in the region, you need to know why you should be concerned with earthquakes, what you can expect during and after a quake, and what you need to do beforehand to be safe and reduce damage. Request a hard copy: Please email Susan Garcia. 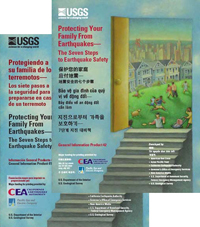 Additional resources pertinent to our general interest publications about the threat posed by earthquakes in the San Francisco Bay region. A Series of ten short articles for students, teachers, and families. This site is designed to help you to identify potential hazards in the home, and recommends methods for fixing them.